Kevin Harvick punched his ticket to Homestead with a thrilling win at Texas — a race, believe it or not, won last year by Carl Edwards (remember him?). They say everything’s bigger in Texas, which isn’t very accurate if Harvick’s really only three inches tall. This season, everybody expects Martin Truex Jr. and the No. 78 team to contend for wins each week, especially on 1.5-mile tracks like Texas. Truex nearly grabbed his eighth win of the season, until Harvick tracked him down and passed him in the closing laps (oh yeah, spoiler — oops). Harvick’s victory advances him to the Championship 4 to battle it out at Homestead. Fantasy racing players banking on what looked like a lock for Truex, however, might have been less excited about the finish. Thumbs up to Truex for letting somebody else have a chance to win a race. But more importantly, his loss changed his 1.5-mile win ratio this season to 6 out of 9. Nice. It’s November, like, a week after Halloween. Everybody’s Googling how to cook turkey. North Face jackets and pumpkin spice lattes, y’know? Then, why is it over 90 degrees on race weekend?! Last weekend’s race in Texas was the hottest ever recorded. Yes, in November. Warm weather is good and fine, but maybe a little unexpected when there are holiday decorations in every major retail store. Thumbs down for weather not conducive to busting out those new Ugg boots. Texas Motor Speedway, always doing things its own unique way, had some fun during driver introductions before Sunday’s race, as Reddit user /u/DlmaoC captured. The quip displayed on screen for Kyle Busch hinted that he wouldn’t be the most universally booed at the track in light of recent events. Once a championship favorite, Kyle Larson’s had a rough patch in the last three weeks, culminating in his third failure to finish in as many races. Texas looked like a promising race for Larson, who’d been knocked out of championship contention after an engine failure at Kansas. He won the race’s second stage but retired early after a fiery crash on lap 282. In his post-race interview, he made it clear he’s ready for 2017 to end. “Can’t wait for the last lap at Homestead,” Kyle Larson tells NBCSN. Thumbs down for the unlucky spell for a future champ. It took 34 races, but the effort paid off for Truex and the No. 78 Furniture Row Racing team. 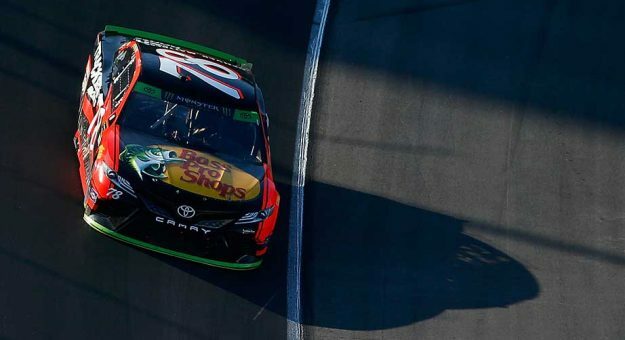 After winning more stages and races than most could count, Truex’s second-place finish gave him enough points to clinch one of the four coveted championship spots at Homestead. Sure, the team would have loved to win another race, but it must feel good to use a season’s worth of playoff points for something, right?! Of course, this means only one position remains for one of the five non-clinched championship contenders to secure. We’ll see what happens at Phoenix. Thumbs up for putting all those playoff points to use. They certainly earned them.